Being able to join a group for a short one-mile eco-walk at San Tan Regional Park on Saturday provides impetus for sharing some thoughts from a t-shirt I bought at the park store. Although this is definitely not my usual source of inspiration, I’m confident you will appreciate the suggestions in these next few blogs! 1. GET PLENTY OF SUNSHINE. Today was another gorgeous day here in Phoenix- blue skies, sunshine- and I simply had to take a walk. I realize that regardless of my schedule, I want to spend at least 30 minutes outside walking. Having lived in Columbus, Ohio as well as Louisville, Cincinnati, and Chicago a total of almost 40 years (a majority of my life! )…my body, spirit and mind have completely embraced the blue skies and sunshine. As I read why sunshine is so important to us, I realized with renewed enthusiasm why I like living here! The body makes vitamin D when the skin is directly exposed to the sun. Ten to 15 minutes of sunshine three times weekly is enough to produce the body’s requirement of vitamin D. The sun needs to shine on the skin of your face, arms, back, or legs (without sunscreen). In general, people over age 50 need higher amounts of vitamin D than younger people. Here’s the bad news: People who do not live in sunny places may not make enough vitamin D. Skin that is exposed to sunshine indoors through a window will not produce vitamin D. Cloudy days, shade, and having dark-colored skin also cut down on the amount of vitamin D the skin makes. Very few foods are naturally high in Vitamin D. Since many of the listed foods (i.e., dairy, fortified breakfast cereals) are not included in our menu choices, we have chosen to supplement with Mannatech’s Omega 3 with Vitamin D3 gel caps. Since they are both fat-soluble,we’re getting 2 supplements for 1! One serving of two gel caps provides 830 IU of Vit D3 and 1110 mg of Omega 3 (triple molecular distillation; both EPA and DHA). Let me know if you have questions or would like to order a bottle. BTW, a pleasant lemon flavor eliminates a fishy aftertaste- something we experienced with other fish oil products. Another article on sunshine and vitamin D mentioned a number of research articles linking Vitamin D deficiency to several chronic health challenges. Because it has been suggested that perhaps 90% of us are vitamin D deficient, that connection is not surprising! If you are having trouble with the winter blues, you might check out my previous blog. Evidences of spring have started. I encourage you to start walking outside—get that vitamin D! You may experience an extra benefit: a sunny disposition, something everyone will appreciate! How are you getting your vitamin D? If there is anything I can do for you, please don’t hesitate to email or phone/text. Sometimes you have to trick kids (and adults!) into choosing healthier snacks. As a working Mama with two kids in daycare, I am no stranger to all of the germs that kiddos can pass around to each out. 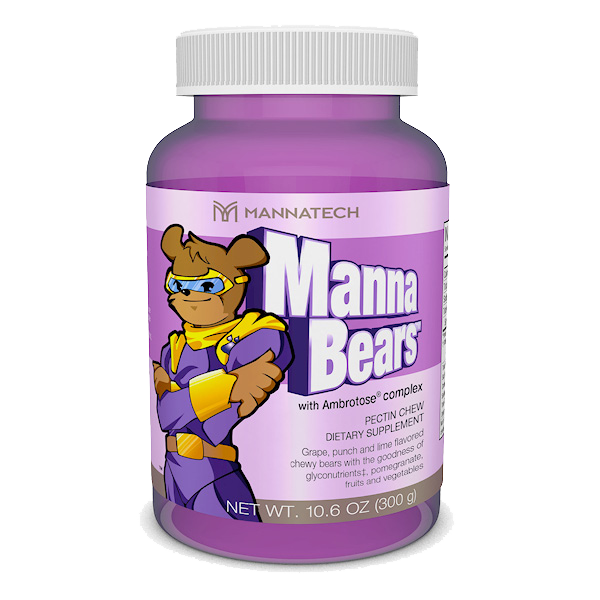 I am thankful that I found Mannatech and the Mannabears. My boys both love these healthy gummies and since we've been using them in our family, my boys no longer have the 'daycare nose' and they're both so much healthier!